Luffy and crew must contend with "Saw-Tooth" Arlong and his nasty Fish- Man pirates. Arlong's pirates specialize in using mafia tactics to squeeze the lifeblood from innocent villagers. Needless to say, it comes as a big surprise to everyone that pirate-hating Nami is actually a member of Arlong's crew! Always incredulous, Luffy won't believe anything until he's had a nap and a good meal. In the interim, however, Luffy's crew meets up with Nojiko, Nami's tangerine-growing sister, and the residents of Coco Village. They reveal Nami's tragic pact with Arlong and her dreams for the future. 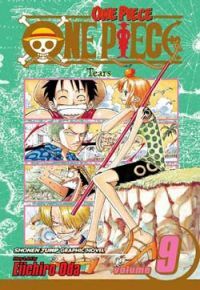 Will Luffy and crew step in to help out Coco Village and their resident pirate Nami?